* Break-the-fast dinner following Yom Kippur services. Meetings are open to anyone who wishes to attend. Join in the lively discussions about our ongoing projects and new ideas for future projects, while you lend a hand to make our events successful. 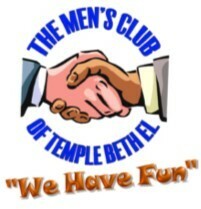 In addition to special events, the Men's Club takes responsibility for bringing Shabbat services to online viewers, recording and broadcasting through Livestream. Wiring, operating and maintaining the audio/visual system in the sanctuary and social hall has allowed snowbirds and those physically unable to be present in the sanctuary to literally stay plugged in to Temple life.